When you come to a post simply pull it out. Why didn’t somebody think of this before? From the invention shed of Malcolm Webster another breakthrough do-it-yourself innovation. It looks like a giant rope jammer fitting off a sailing boat. It fits to the 3-point linkage on your tractor. No electrics, no hydraulics. You simply stay in the driver’s seat while reversing down the line, lifting posts and pulling out vines by the roots (they won’t grow back). The efficiency, simplicity and ruggedness of this contraption is really surprising. Any tractor driver can do it. The pulling jaws open wide when you lower the linkage, (actioned by two ropes tied to the top of the tractor roll bar). Positioning up to a post or vine is easy, as you are looking right down on to it as you back up. The jaws slide easily on ground skids and automatically grab when you lift. If a second pull is required, the jaws slip back down for another grab. 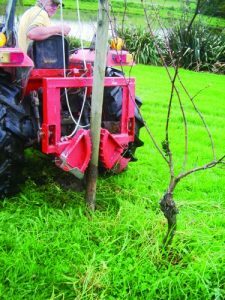 The new Post and Grapevine Lifter is available now, take a look at Malcolm’s website www.fencershand.co.nz fresh from the Mystery Creek field days, it has lots of other great new ideas and products to make life on a rural property easier and more enjoyable.